Do Uranus, Neptune, and Saturn Not Exist in the Future? I think the academy villa on Moon Island could still make for an interesting spin-off. Who are Chibiusa's teachers and classmates there? What do they study? Lots of potential! Based on Google's and Bing's translation engines, I'd judge the Kodansha "Moon Island" translation is the correct one, and Alex Glover and Miss Dream are wrong. Pluto/Setsuna is given two different stories in Infinity. 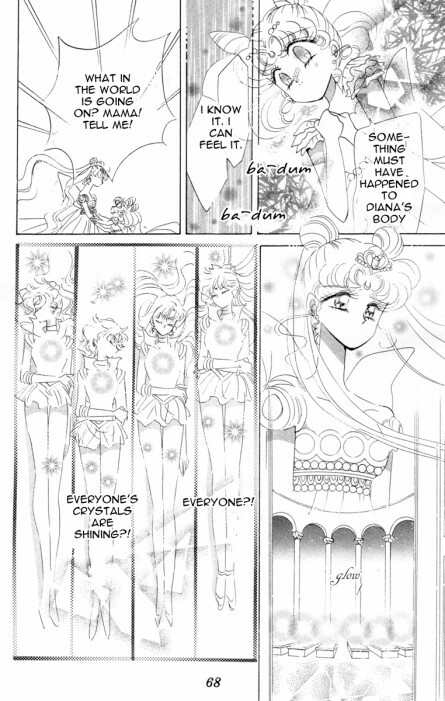 In Act 32, Pluto says she was reincarnated thanks to Neo Queen Serenity, who lent her her power. 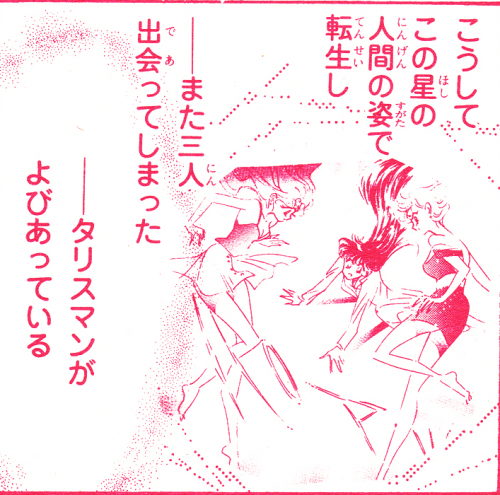 But then in Act 33, Michiru (who I believe is the one speaking) suggests she, Uranus, and Pluto were all reincarnated on Earth along with everyone else following the collapse of Silver Millennium (the artwork supports this). WHICH IS IT? I borrowed* the power of your beautiful and most revered mother, the magnificent Neo-Queen Serenity, to be reincarnated for a mission of vital importance. Pluto is clearly attributing her reincarnation to NQS, though I can't quite parse whether or not NQS was actively responsible (*i.e., I'm not quite sure if dead!Pluto somehow helped herself to some of NQS's power to be reincarnated, or if NQS actively lent her power to Pluto to revive her). The territories we protected were far apart from each other. By all rights, we ought never to have met. But then we were reincarnated as humans on this planet. The three of us met again. ...The Talismans were calling out. We felt there was no stopping them anymore. And, while chasing after the invaders, we found them in the center of this accursed delta. The enemy was right in our hands. 1. Since they were never supposed to meet, does that mean Uranus and Neptune only started dating on Earth, or do you think they had a long-distance relationship? 2. It's interesting that the original text says they were "reincarnated in human form," as though they were not initially human(oid). This makes it seem like they were all reincarnated and awakened together. (Which would have probably made more sense, but whatever...) This seems to contradict NQS's being involved in Pluto's reincarnation. Pluto is guarding the dpace time door which was around the castle or so it seemed because Chibi Usa was there all the time. I think the other guardians just live away. They were never that close to them and always kept some distance. Just goes to show how Naoko really was crafting the story on the fly as she went along. Wow! You sure know your stuff, Sabr! I always look forward to your posts! At this point in the story, Mamoru, the Inners, the Outers, and Saturn have had their Sailor Crystals stolen from them and been killed by Galaxia and the Animamates, yet we are clearly shown six and only six coffins/beds, all occupied by the Inners, Mamoru, and Pluto. So what gives? Why did Naoko not include Uranus, Neptune, and Saturn in this scene? As far as I can tell, in none of the scenes set in Crystal Tokyo following their introduction in the manga do Uranus, Neptune, or Saturn make an appearance or get a mention. Now, Saturn I can understand. In the Infinity arc, Pluto seems to suggest that Saturn was not originally meant to awaken, and the events being induced by the Death Busters that ultimately result in her awakening are some sort of aberration of time/destiny. Certainly if Saturn existed in Crystal Tokyo, Chibiusa would have already known her and been friends with her, so it makes sense that Saturn might not exist in Chibiusa's Crystal Tokyo. 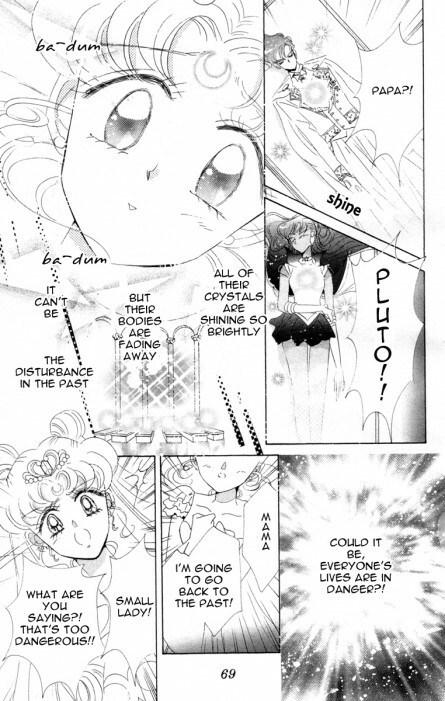 Similarly, if Uranus and Neptune existed in the future, she should/would have recognized them, and if the whole Death Busters thing was just some aberration of time/destiny, I suppose it makes sense that in the timeline whence Chibiusa hails, they too would not have awakened. But you would think that once she returned to the future she would have said to her parents, "Hey, I just met three new Sailor Guardians, why don't we track them down? They'd be a big help around here!" I mean, awakened or not, they and their Sailor Crystals still exist, so....where are they? What's the deal? What do you guys think? Do Uranus, Neptune, and Saturn exist in the future and we just don't see or hear about them? If so, why? Where are they? What are they doing? And if you don't think they're supposed to be around in the future, is it due to the reasons I've given above or some other reason? Why would Naoko not want to include them? 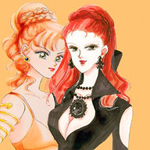 Or maybe Usagi just got super conservative in her old age and decided to banish all lesbians from her kingdom. Let us review here.In the R arc the outer s didn't igsist yet.Uranus and Neptune do not have a post in the future.After the Infinity arc.The outer have different post.Uranus,and Neptune are probably are at their respective posts. 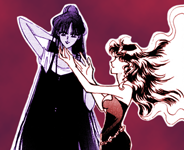 The fact that Naoko bothered to show Sailor Pluto in the future when Future!Pluto died during the Black Moon arc and her body was reincarnated in the 21st Century creating a huge plot hole... and yet Chibiusa didn’t even show any concern for her supposed best friend Sailor Saturn because she’s off screen? Sounds like bad writing to me.